5-3-3 Community Centre in Urban Spaces- Do They Lack A Local Communities? The Grove Neighbourhood Centre is named after its ward. A ward is the lowest unit of administrative areas. As Borough Councillors are elected for each ward, the boundaries are reconsidered according to population or a change in policies. A ward is not a unit or boundary that has a direct bearing on the everyday life of residents or on their social relations. The Neighbourhood Council shall serve the following areas: The area bounded on the north by the Goldhawk Road, on the west by Paddenswick Road and then as it becomes Ravenscourt Road, on the south by King Street and on the east by Hammersmith Grove. These areas form a trapezoidal shape widening towards the east (approx. 800 metres on the north, approx. 700 metres on the west, approx. 800 metres on the south, and approx. 950 metres on the east), and a population of 9,804 and 3,8831 households according to the Census 1971. The boundaries of the Grove Ward later changed to inward streets; 150 metres from the east and approximately 200 metres from the south.2 Despite this change, the Grove Neighbourhood Council maintained the same boundaries set in 1973. Furthermore, the number of wards in the London Borough of Hammersmith and Fulham were greatly modified from 23 to 16 in 2003. The Grove Ward was divided into two parts; the Ravenscourt Park Ward (at present 2003, 10,791 population) and the Hammersmith Broadway Ward (11,560 population). This means that neither the name �gGrove�h nor such an administrative district exist in London today. Seemingly, this disappearance of the Grove Ward has had little impact on activities of the Grove Neighbourhood Council. The geographical location of the old ward only becomes an issue when councillors are elected every two years. Only the residents of the old Grove Ward are eligible for candidature. However, the number of candidates has not exceeded the maximum number of twenty since the 1990s so that councillors have been elected without voting. When the number of elected councillors is less than the maximum of twenty, councillors are able to recommend a candidate from outside the old Grove, then the council may co-opt. Indeed the current council includes councillors from outside the old Grove Ward. Users of the Centre come not only from the old Grove, but also from all over the Borough of Hammersmith and Fulham. Today, a ward is nothing but a constituency. It is an artificial boundary determined by the local government by considering population and so forth. I think to most residents, the ward/council is really about rubbish collection. In many cases, the ward does not relate to residents�f everyday lives or community spirit. However, until 2002, the Grove was surrounded by the big roads, so they served as natural boundaries. Therefore, perhaps some of the elder people may have a sense of identity. The old Grove was considered a working class area for a long time after the end of the 19th century. However, due to the expansion of inner London, young middle-class people have started moving into Hammersmith since the 1970s. There was a substantial influx of people who worked in inner London. Most of them were young and single, or couples without children. Moreover, gentrification5 of residents began at the same time. The young middle class couples move out when they have children for bigger houses, and a better environment for their children. The property prices had already risen, so they could sell their house for a large profit. Initially there was much private rented accommodation in the Grove. The initial residents could not afford to buy a house around here so they moved out to another area. The old Grove ward has a high turnover of residents. The electoral register shows a turnover of about 25% of voters a year in the old Grove. It may not be very accurate because the Grove no longer exists. At present residents may only know a few people on their street. The majority of population is white English, but also quite a substantial number of Irish people. There are a lot of people from ethnic minorities; Polish, and also some other Eastern Europeans around here. They are not located in a particular area; there are no big groupings. The 1991 Census6 shows that Grove has a population of 5,870 of which the breakdown is 85% White, 9% Black (5% Caribbean, 2% African, 2% Other), 2% Indian, Pakistan, and Bangladeshi, 2% Chinese, and other Asians, and 2% others. 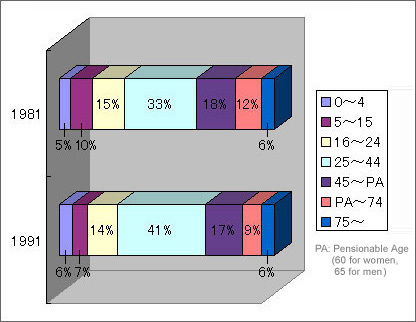 As for age groups, the group of 75 years and over is small of 6%. The group of 25 to 44 years, a relatively young group accounts for 41% and this age group includes young middle class residents who work in the City. 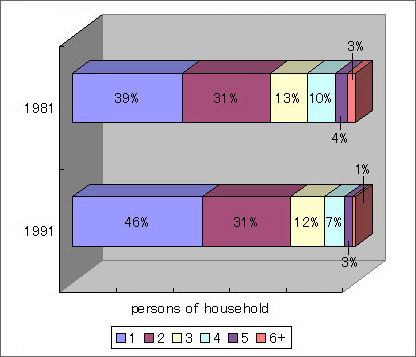 Regarding households, 46% live alone, and 31% is of two people, so 77% of total households are small households. 18% residents moved into the Grove within the last year. The high migration rate applies to the committee members and users. The majority of the current staff of the Centre and local residents moved into the Grove area after the Centre was organised and many former Grove Committee members moved out from the ward. I have been questioning why people do not know and are not concerned with the Grove Neighbourhood Centre, but some people have moved and among those who remain, it is quite natural that memories fade. The question is therefore why the Grove Neighbourhood Council and the Centre were organised within an artificial geographical boundary in an area with such a high turnover of residents that it was hard to bring people together as a community. During the thirty years since that time, the area has changed so greatly that it has lost its local community as a foundation for the community centre. In the next chapter, I will illuminate the circumstances in which the Grove Neighbourhood Council started in the 1970s from a variety of documents of those days. 3 The materials (2001 Census Key Statistics) of Her Majesty�fs Stationary Office obtained from http:// www. statistics. gov. uk/census2001/profiles/ 00an.asp, and the Environment Department at the Town Hall in the Hammersmith and Fulham Borough. 4 London Borough of Hammersmith and Fulham, 2002, pp.4-5. In ten years from now, the population increase rate is estimated to be 2%. 5 Several residents other than this Councillor described the social transition in the Grove Ward after the 1970s as �ggentrification�h in the interviews. Sonobe (2001, pp. 195-199) introduces the most loose concept of gentrification as: �ga phenomenon that the middle class return to the centre of the urban areas.�h (Savage and Warde, 1993, p.80) Moreover, Sonobe defines the point at issue concerning gentrification in the Anglo-Saxon sphere. Regarding gentrification in inner London in the 1970s, Hamnett and Williams(1980) mention the following characteristics because there are entangled physical, social, and cultural factors. A group of residents in an area changed from working class to middle class group (majority of them are executives and specialists). If a household has children under the age of five, a household is at the early stage of its cycle. It is not a migration from the suburbs to the inner city, but it is an influx from other parts of the central city. Houses are refurbished to be in accord with the lifestyle of new residents and the property value in that area rises suddenly. Arisue (1999) describes housing conditions in London and gentrification (pp. 104-106) and remarks: �gafter the second half of the 1970s, due to the policy of privatisation by the Thatcher Administration, much public housing was disposed of. 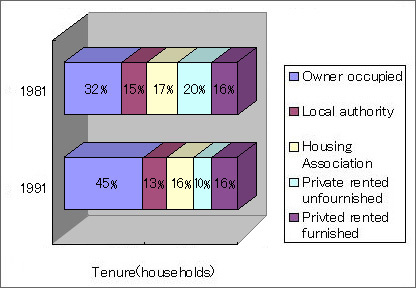 This means that the process of working class housing being �eremodelled�f to middle class housing has been proceeding.�h (p.126) Hamnett (2003), and Butler with Robson (2003) describe gentrification in London from the 1960s and 70s to the present in detail. The issue of the definite phenomenon of �ggentrification�h in the Grove Ward is interesting when I consider a transition of space and local society including Grove in terms of politics, economy, society, structure of culture in London or England, and globalisation in the world. This is an issue for my future research.